Thank you for visiting our site! We are proud of our business and encourage you to visit us in our showroom. In 1992 we began our full-time career in kitchens and cabinetry. As we grew, we found ourselves naturally progressing into bathrooms and flooring in order to offer a full service for our clients, taking them from the beginning to the end of a project. We know how overwhelming a large project can seem. This is why we have a team that loves their work, excels in service, knowledge and skills, and strives to provide an enjoyable experience for each and every client. Our team works together to give you "the total package." Our professional and friendly sales staff work with you on consulting, designing, and putting your ideas down on paper. Our skilled cabinet makers and installers work with you and the sales staff to ensure your project is completed to your satisfaction. Over 75% of our staff have over 20 years of experience in their trade! As much as we're proud of their skills and experience, we're equally proud of the continuous letters and comments coming from our customers about how much they enjoyed working with both our sales staff and our installers. 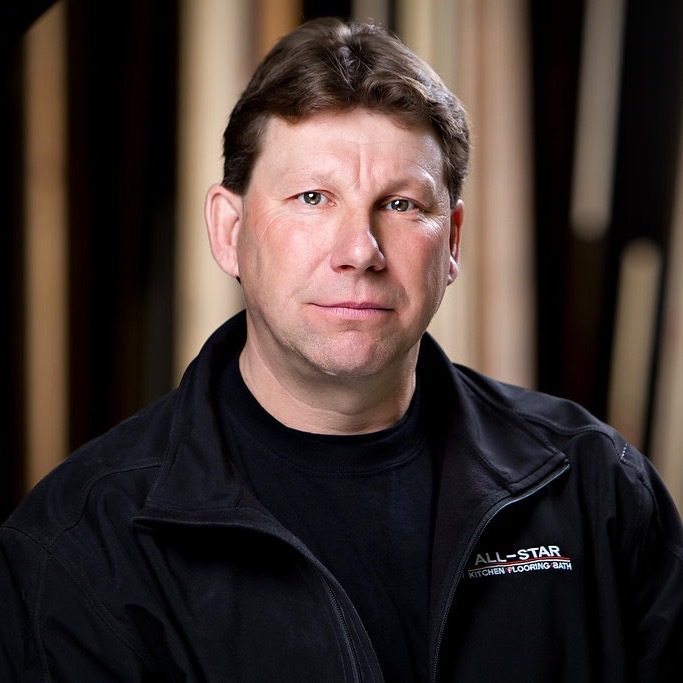 Karl is a licensed Industrial Wood Worker with 40 years in the kitchen and bath industry. Marilyn has been involved in the business since day 1 and acts as the Office and Showroom Manager. They're both very excited and proud of their growing business. They have an amazing staff, love meeting and interacting with their customers, and always look forward to taking on new challenges. Angela (daughter of Karl & Marilyn) and Andrew will soon be running the family business. Andrew is a Wood Products Technician and is working towards his Red Seal in Cabinetry. Working for All-Star since 2010, he's proven to be extremely proficient in both the shop and in the field. Andrew is now managing daily operations for All-Star and Angela is working part-time in the showroom and with bookkeeping in the office. They have 2 beautiful young children...so far! Patty is one of those people with whom you immediately feel comfortable with. She's had many years of experience in sales, and under her guidance, you'll be amazed at how easily your project becomes a reality. Sherry is a "ray of sunshine" to both her customers and fellow employees. Specializing in bathrooms and kitchens, she can assist you in choosing products and colours, and will guide you from the beginning to the end of your project. You won't find a better salesman anywhere! Wayne has an incredible knowledge of both flooring AND kitchens and baths. With his easy-going manner, customers warm up to Wayne right away as he walks you easily through each step of your project. Dwight has been with All-Star for close to 20 years. He is a licensed carpenter with an infectious positive attitude that puts everyone working around him in a good mood! There isn't much he hasn't seen in the industry and is an invaluable employee both in the shop and in the field. Guido was educated in Germany for woodworking, design, and drafting. We have been fortunate to have Guido's expertise here at All-Star since 2014. He's become a valuable member of the team and his knowledge and craftsmanship are evident in every project in which he is involved. Mark is a well-rounded cabinetmaker in both experience and training, and is educated in industrial woodworking techniques. Polite and easy-going, he also has a good work ethic which translates into every project. He's equally comfortable and valuable in the shop and on installations. Trevor came to work with the All-Star Team in 2013 having worked over 30 years in the industry with his own business. His knowledge and skill have been an incredible asset for All-Star, not to mention his good humour and quick wit, which keeps everyone smiling! With Josh you get "the whole package!" He is a licensed carpenter with over 15 years in the business. He is not only outgoing and friendly but is also a great problem-solver while working on projects. He's become a terrific asset on our various installation teams. Andre has been installing floors for over 25 years and is extremely knowledgeable about all types of flooring. He's kind, diligent, and insists on doing the job right. His skill and experience is always reflected in his work! Sean is an excellent floor installer and working alongside Andre, continues to gain valuable experience. He's always ready to help out and "go-the-extra-mile" for both his customers and his fellow co-workers. With his positive attitude, and perpetual smile, he's been a great asset to the All-Star Team.